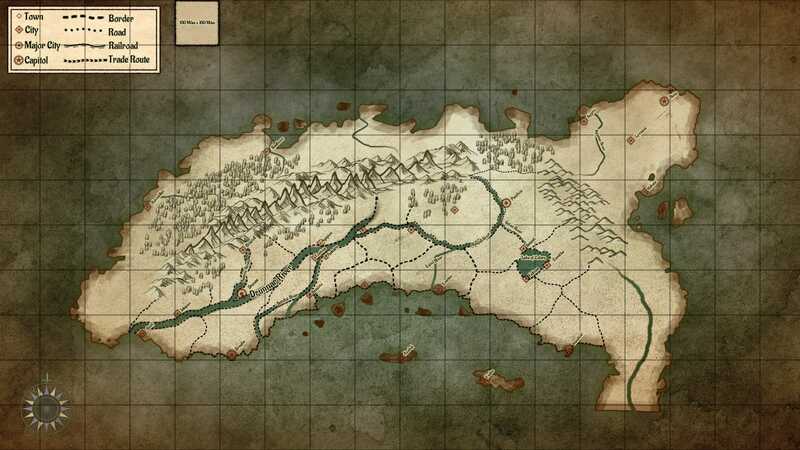 The continent of Vrasia is a giant landmass dominating the western “hemisphere”. It is divided into northern and southern landmasses by the succinctly named Middle Sea. The climate of northern Vrasia is influenced primarily be the Rimfell Mountain range that runs along the northwest coast. Westerly winds off the ocean run inland and break up against the mountains. The Seaward lands along the northern coast are rocky and harsh, with heavy winds and abundant precipitation. The center of North Vrasia on the other hand lies in the shelter of the mountains. The regions have a mild and forgiving climate. Forest and rolling hills interspersed with slow, meandering rivers make these areas easily habitable. Northerly breezes from the middle sea bring warm air and precipitation from the south, keeping the region temperate, unlike the great deserts to the south. As one continues south into the lands the east of the middle sea, the climate becomes increasing hot and arid. Although the lands near the coast and near the few rivers in the region remain arable, moving afield of a water source the land becomes unforgiving and unsuitable for agriculture. The effect of the Rimfell Mountains in northern Vrasia is mirrored to a much greater degree on the southern half of the continent. The Xoquall mountains that run along the west coast of southern Vrasia are the longest mountain range in the world and contain several of the planets highest peaks. Running directly along the coast, the mountains themselves are covered in lush cloud and rain forests on their western faces, but the land quickly becomes dry and arid in their lee. The wind break from the Xoqualls coupled with the northerly winds that predominate over the middle sea leave the northern half of South Vrasia a vast expanse of rolling sand dunes where a hapless traveler may face many hundreds of miles between water sources. The life blood of South Vrasia is the Twin Serpents, the rivers Shafra and Ngozi. Towards the end of every summer, vast quantities of rain fall onto the Xoqualls, were it coalesces into a number of rivers flowing out of the mountains. These eventually converge into the Shafra to the east and the Ngozi to the west. These torrential rains cause the Twin Serpents to swell to vast size and overflow their boundaries every winter. The flood plains left in the wake of these inundations allow great cities to flourish along the highest points on the banks of the Twin Serpents, were even a mere handful of miles from either bank the land become too brutal and barren for habitation. Towards the southern tip of the continent, the Xoqualls fade out into foothills and the water from the winds and rains from the sea move freely across the land, covering it in lush jungles and dense rainforests.